In this tutorial, a S-R latch is designed and written in VHDL, it is then implemented on a Xilinx CPLD. This video shows the VHDL S-R latch operating. An S-R latch (set-reset latch) made from two NOR gates is shown below. This latch has active high inputs. The S-R latch is implemented as shown below in this VHDL example. The not Q output is left internal to the latch and is not taken to an external pin. The not Q pin will always be at the opposite logic level as the Q pin. With both the S and R inputs at logic 0 level, the Q output will be latched at whatever value it was at. When at logic 0, the S and R inputs do not influence the output of the latch. When R goes high, the latch is reset – meaning that Q goes low. This assumes that S is low. If R goes low again, the output of the latch will remain latched low. In other words, a positive pulse on R resets Q when S is low. With R low, when the S input goes high, the output of the latch will go high. If S is taken low after this, the Q output will remain latched high. In other words, a positive pulse on S sets Q when R is low. R and S must never be allowed to go high at the same time. This is an undefined state for this type of latch. Before reading further, take a few minutes to think how you would design this latch using the VHDL that you have learned so far on this course. Next, the logic needs to be designed using VHDL code. The not Q output will need to be defined as an internal signal as it is still part of the S-R latch, even though it was decided not to wire it to the outside of the latch. This signal will be added to the architecture part of the code. Let's take another look at the S-R latch and then design the logic. The Q output is made by NORing its two inputs. 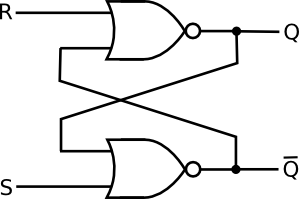 Its two inputs are R and the output of the second NOR gate – not Q. The VHDL code for the top NOR gate would then look like this. The not Q output is made by NORing S and Q together. This is now added to the VHDL code. When the above code is synthesized, e.g. by using the Xilinx software tools, an error will be generated. The error from the Xilinx tools states: Parameter Q of mode out can not be associated with a formal parameter of mode in. This error is occurring because Q is an output and its value can't be read – i.e. it is read when NORing S and Q together to generate the notQ output. One way of solving this problem is to use another internal signal that will contain the value of Q. We will then be able to read this signal. Remember that the above statements are running concurrently, so it does not matter which order the statements are in. An even simpler method of solving this problem is to define the Q pin of type inout instead of out. This makes the Q pin readable within the VHDL code. This source code is for the above two solutions to creating a S-R latch in VHDL. The VHDL, UCF and JED files are included. The UCF and JED files are configured for the home built CPLD board.